Use the Single-Chip Compiler and the ICD-U40 for programming and debugging your code. 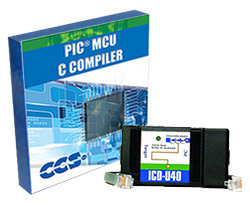 The ICD-U40 is a low-cost complete In-Circuit Programmer and Debugger. Allows for debugging at the C level with the C-Aware Debugger included in the compiler. The Single-Chip IDE Compiler allows students to choose one microcontroller from the PIC16 or PIC18 family to be supported. Additional devices may be added separately. Please specify your chip in the comments section of the order form. Note: This product is for educational purposes only. A valid student ID is required to purchase this product.